The connection between traditional Chinese ideas about the Sinew channels, tendon strength and power, and recent discoveries about fascia and its relation to health and fitness are fascinating. This series of six articles by Tom Bisio titled, “Tendon Strength, Fascia, the Sinew Channels & Internal Martial Arts”, explores some of these connections. 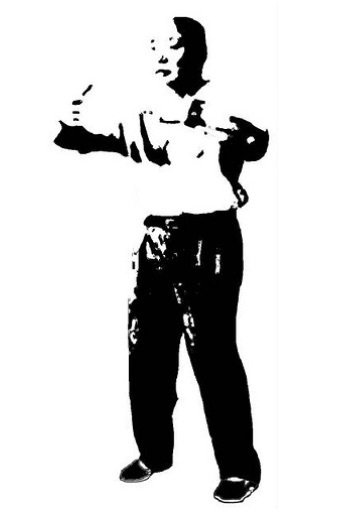 The Six Harmonies (Liu He) and Nine Sections are important concepts in understanding the dynamics of force transmission in the internal martial arts. In the Internal Martial Arts, the shoulder and hip move together and support each other, as do the elbow and knee, and hand and foot. These connections mean that these joints are linked and line up for efficient structure and power delivery. The shoulder is considered to be the “root” of the arm, the elbow is the “middle” and the hand is the “tip”. Similarly, the hip is the root, the knee is the middle and the foot is the tip. Power and force come from the root and manifest in the tip. In substance this dynamic is the same – or should be – in both internal and external exercise and internal and external martial arts. The Three Internal Harmonies must link with the three External Harmonies in a seamless way. The Mind-Intention (Yi) guides the Qi, which in turn actualizes force and power (Jin-Li), which are themselves an expression of the mind and intention. One uses the breath to relax the muscles and tissues while making sure the limbs are slightly bent or curved. Then the accumulated internal Qi (and potentiated power) is compressed like a spring and the relaxed muscles lengthen like a bowstring that is stretched and ready to shoot. Qi is then released and goes outward. Movement and power must be initiated by Dantian and Mingmen rather than by the limbs, otherwise there is no connection to the body’s foundation and power will not be rooted. Tensegrity is a term coined by R. Buckmister-Fuller to describe structures that maintain their integrity primarily through the balance of tensile forces that pass through the structure, as in for example a spider’s web, as opposed to maintaining structural integrity through gravitational loading, as in a Greek temple. 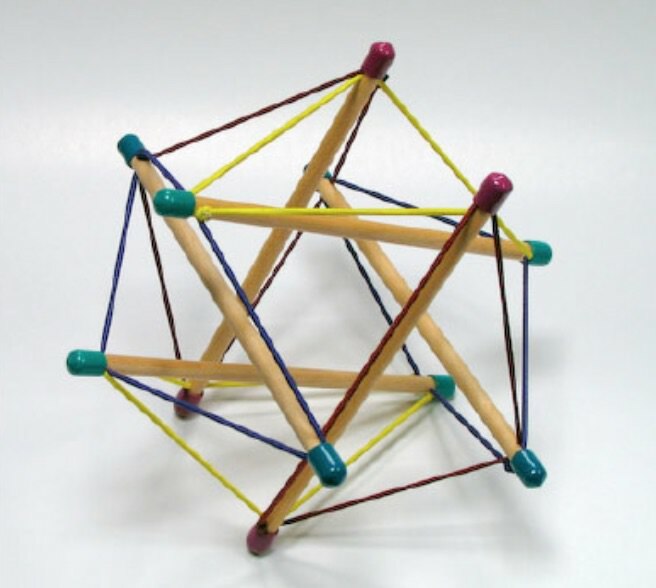 A typical Tensegrity model like the one shown below, to some degree illustrates how the human body maintains its structural integrity. The rods in the model below can be likened to the bones and the elastic cords to the fascia, which connect, wrap and contain the bones. This arrangement allows maximum strength for the materials at hand because the web of elastic forces, rather than mass, hold it together. Any strain or load placed against one part of the structure is distributed throughout the structure, even on the opposite side or distally. When compression is released, the components spring back to their original position. The tensegrity of the fascia is reproduced down to the cellular level. This allows the body’s structure to distribute stress throughout the entire system, thereby remaining resilient to the effects of external forces. Every time we move and the skin stretches, the extra-cellular matrix also stretches. The cells distort, and the interconnected molecules that make up the internal structural matrix of the cell feel the pull without any discontinuity or break in their linkage. The strain is distributed across and throughout the body, even across meridians, myofascial lines, bones, muscles tendons and ligaments. The practice of Zhan Zhuang (“Stake Standing”) is a good example of Tensegrity in action. Standing or holding fixed postures is one of the fundamental exercises in internal martial arts. In holding the embrace posture for example, the body relaxes, and the joints are aligned (external harmonies). As one stands, the intention guides the Qi to the tips of the body, so that Qi fills the entire body. At the same time, there are oppositional forces operating in every direction which are not a product of bone, muscle and sinew but of the intention. The head and upper back erect upward, while the tailbone sinks down, producing oppositional forces that pull the spine in opposite directions. The arms feel like they are supporting and embracing inward, while at the same time the arms are pulling apart. Simultaneously, throughout the body, there is twisting, spiraling, wrapping inward and outward, extending and stretching, retracting, embracing, pulling apart and pushing together. These forces are manifestations of Yin and Yang, positive and negative – they are oppositional but also complimentary. When these forces are balanced, body tension is minimized, but the body is also loaded to move in any direction. All of this is a product of internal intention and internal “movement,” occurring without visible (external) muscle tension or movement. Additionally, in holding postures or body patterns, whether they are San Ti Shi (in Xing Yi) or Ding Shi (in Ba Gua Zhang), there is an internal sensing going on. The oppositional and yet complimentary forces allow one to sense the stillness within movement, and the movement within stillness. Two equal and opposing forces produce no visible movement – they allow one to sense stillness. Yet within this stillness the forces are still operating – there is movement inside. As the body relaxes into the postures, one feels comfortable and at ease, the muscles relax and the bones seem to support the body, while the muscles slacken and let go. Within this relaxation, this slackening, there is still force and strength, the product of the oppositional forces. Within this strength there is relaxation and flexibility. The body is not committed in any one direction; it is moving in all directions at the same time. Even though the body may feel still, and appears to be still, there is a faint stirring of movement that is constantly in the process of being actualized. Compressive forces on one part of the body are distributed around whole body through this web-like facial tensegrity network. Force applied against the arms is absorbed by distributing the force into Dantian, the lower body, the feet and the floor. This is more easily achieved if the body stays relaxed and supple, so that it can detect the moment-to-moment changes in the incoming force and redirect and redistribute those force vector changes. Qi does not move smoothly and unobstructed through tense tissue. Because Qi is responsible for our ability to sense and perceive and sensation the body must be relaxed and supple in order to take advantage of tensegrity of the fascial web. Qi and Breath are intimately connected. This connection certainly involves the “Breath (Qi) of Heaven”, which brings in the oxygen that not only keeps us alive, but is also necessary for a host of body functions. Respiration oxygenates the blood and expels waste products like carbon dioxide. At a cellular level, oxygen is the indispensable key that unlocks the stored energy of ATP. The breaking of ATP’s chemical bonds provides the energy for mechanical work, electrical impulses, cell division secretion, etc. The body and brain are sensitive to even very small reductions in ATP production. This sensitivity is expressed in terms of aches and pains, confusion, intermittent fatigue and greater susceptibility to infection, and finally, chronic fatigue and persistent illness. Dr. Hendler suggests that improper breathing can actually result in progressive damage to the heart through the cumulative effect of small, but repeated arterial spasms. Dr, Hendler advocates maximizing oxygen flow and ATP production through the very same basic breathing exercise that forms the foundation of internal martial arts training – Kidney Breathing (Dantian Breathing). Breathing, and particularly Dantian or “Kidney Breathing” and its variations – “Reverse Breathing” and “Whole Body Breathing” – is an important aspect of in internal martial arts. Reverse Breathing, in which the lower abdomen relaxes upon inhalation and expands upon exhalation is particularly useful in creating a pressure dynamic in the lower Dantian and Mingmen that pulls on the connective tissue and the sinew channels drawing them inward and connecting them to the ground. This creates an elastic recoil that is constantly gathering and releasing, like a spring coiling and uncoiling.